16-18 9 dives girls/10 dives boys: same as 14-15 for the basic dives but increased difficulty for the optional dives- front 2 1/2 instead of double etc. The following is meet information geared towards the junior Olympic (FINA) and elite level divers. Divers at these levels are expected to compete at the highest level competition they qualify for during the championship season. Divers should attend at least one invitational meet in the fall, winter and spring. In the summer, J.O. divers are expected to attend the highest level of competition they qualify for during the year. Divers qualify for USA diving events by place and for AAU events by score. 1a. USA Diving championship series: The highest priority. If divers qualify for USA Diving Regionals, zones and Nationals, they should attend. Q: How do they qualify for these events? A: Coaches decide when a diver is ready and has the necessary dives to compete at the regional level. Here is the regional map. We are region 4. The top 15 from Regionals advance to the zone meet. 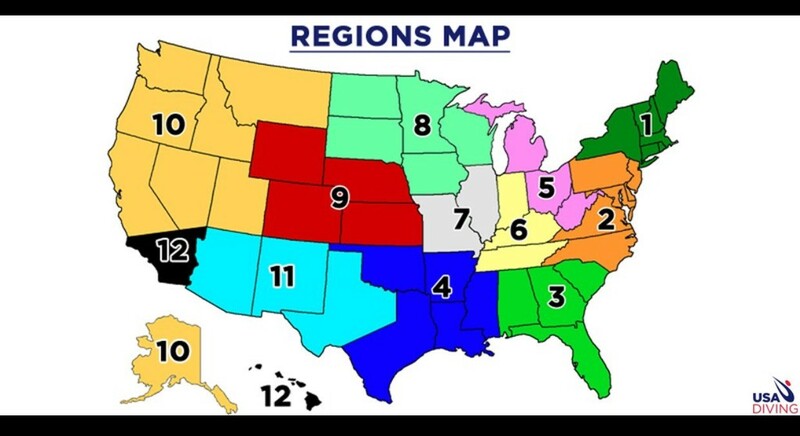 Zones is combined region 3&4. The top 10 from zones go to USD Nationals. 1b. USA Diving Synchro Nationals: The athletes who attend this meet are limited by a high degree of difficulty minimum set by USA Diving. Also divers must be paired up with a teammate. 1c. USA Diving Senior Nationals: A very limited number of elite athletes will be invited by USA Diving to attend this meet. It is optionals only and the minimum score and d.d. is very high. 3. AAU Red/White/Blue Nationals: Spring diving opportunity for J.O. divers. Divers qualify by attending one of the 6 national qualification events. If they place top 6 in their age group, they go to represent their area of the country in the competition. Red is the West coast, White is the middle and Blue is the East coast. 4, Invitational: J.O. divers are encouraged to attend invitational competitions. These meets are low pressure events to allow the divers to practice doing their dives in a competition setting and receiving feedback from the judges and coaches. We suggest selecting an invitational each season of the year. Local invitationals are required for our divers.